*Warning: This story contains some graphic details and photos about a dead whale. Just a heads up if you have a squeamish stomach. I showed up to the West coast town of Montanita in Ecuador with plans of surfing and Spanish. On my first full day in the town, myself and two Italian guys found out about a dead whale on the beach. At first I was really sad about it (if you know me, you know how much I love animals) and then I was actually pretty fascinated and needed to see it. 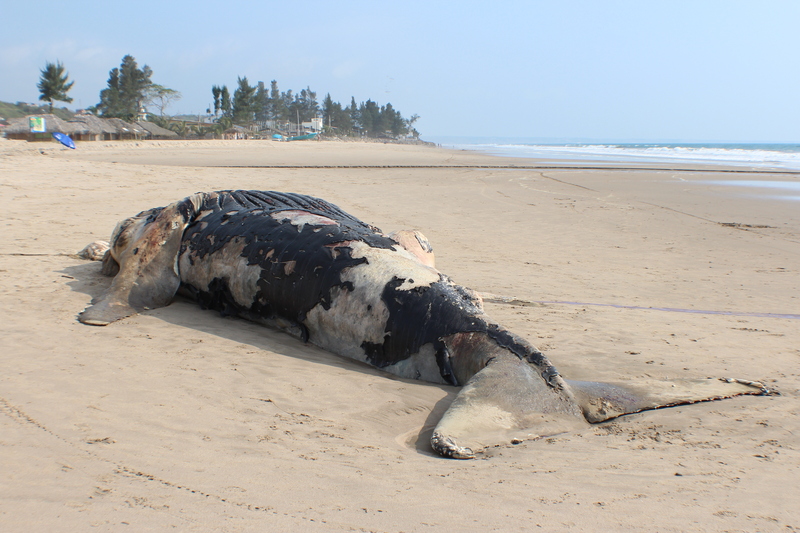 How many times in my life would I get to see a beached, dead whale? Probably never again. So we headed off in the direction we had heard the whale was (thank goodness the Italians could swap over to Spanish easily as I’m usually pretty lost with anything more complicated that “what country are you from?”). It was about a 45 minute walk down the beach and we ran into two locals just coming back from it. They informed us that they had cut part of the head off the day before. (I’m still unsure as to why) and that it had been sitting there for two days already. One of the guys had actually done the slice and dice. Oddly enough he seemed like a guy to do something like that and didn’t really want to talk about it… Kind of creepy. Anyway, we showed up to the whale and it was everything you could imagine in its rotting, putrid decomposition after sitting in equatorial sunshine for a few days. You could see it from pretty far down the beach and I was actually quite entertained by the people sunbathing near to it. 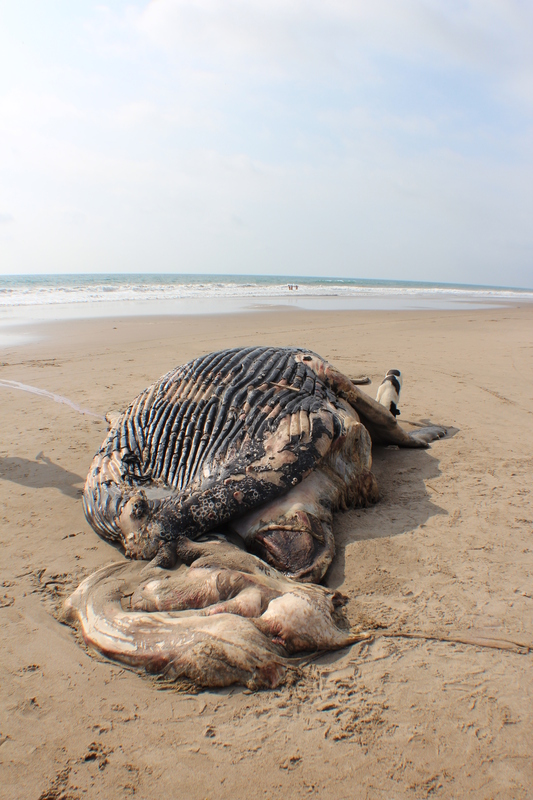 The beach was empty, why would you be so close to a rotting whale? We got up close and personal and of course I had to touch it. It was similar to a warm piece of plastic with just a bit of spring back when I pushed on it. Pieces of its skin had started to peel away and there were a host of carrion birds and interested dogs roaming around. It was pretty big, even though it was just a baby. The front of the whale with the innards sticking out. The whale was pretty huge, about 5 meters in length and a couple in width. I didn’t realize it until a local informed us that it’s just a little baby humpback, still pretty tiny compared to an adult. 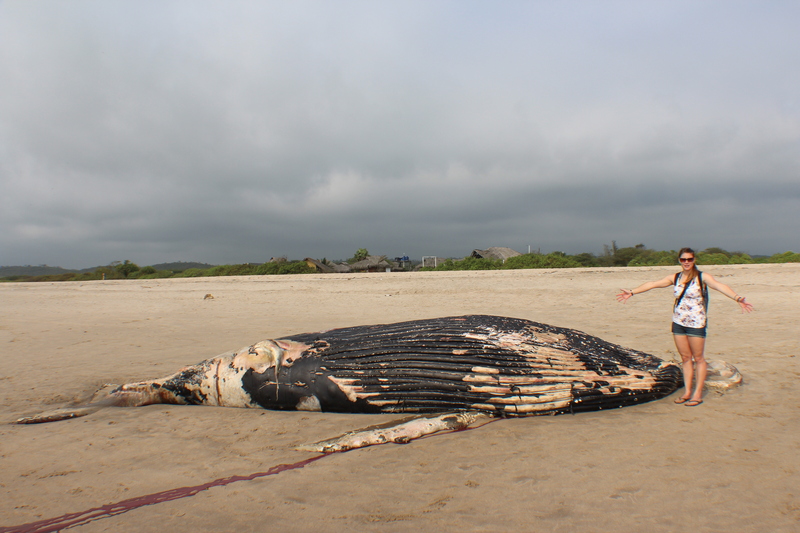 Apparently 12 years ago another whale was stranded in the same spot on the beach about 3 times the size of this one. It was so big they had to bury it on the beach. I can’t imagine how much effort went into digging a deep enough hole to bury the animal and then not have it resurface with the relentless moving of sand by the ocean. And are they planning on burying this little one? Standing downwind from it was a pretty awful idea as it was a rank, rotting fish smell that I couldn’t help but gag at. You could see an area near the head that they had sliced off and I’m still uncertain to what it was they cut off, why they did it, and what they did with it. There was also a mass of flesh, innards I’m sure, coming out from the mouth of the whale. How they ended up outside of its body is also a mystery but I’m assuming it maybe had to do with rolling around in the surf before it beached? Or when they sliced a piece of it off. My knowledge is lacking here. One of the poor dead barnacles on the whale. Kinda cool as it died outside of its shell. A really interesting part was the fact that this whale wasn’t the only creature to die that day. The barnacles that live off the whale met their end as well when they were forced out of the ocean. It was a sad little story looking at them, literally stuck to their fate with no control over getting back into the water. We actually spent a lot of time looking at and contemplating the whale. It’s definitely a sight to be seen and something I don’t think I’ll experience ever again but was really cool (and sad). The biologist in me really would have enjoyed a dissection of the creature had it been a bit fresher. We were curious as to its brain size and wish we had more answers from the locals about why they cut off part of its head. I hope you were as morbidly fascinated about the whale as I was. Any thoughts, ideas, or opinions about the whale, just let me know below in the comments. Next → Next post: For What Do You Work?